A. Most people know nothing of this “Vatican-Moscow Agreement.” Pope John’s legate, Cardinal Tisserant, and K.G.B. Patriarch Nikodim of Russia negotiated that Vatican II and Rome would not condemn Communism, in exchange for the Russian Orthodox sending delegates to the Council (Vat. II). In “Apologia I” by Michael Davies, Archbishop Lefebvre says (p. 151) “The Pastoral Council which brought together 2,350 Bishops said not a word, in spite of the 450 signatures of Fathers demanding a condemnation, which I myself took to Msgr. 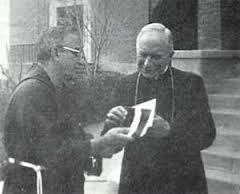 Felici, Secretary of the Council, together with Msgr. Sigaud, Archbishop of Diamantina.” It appears even to our present moment that Pope John’s agreement is honored by the official Vatican. Anti-Apartheid, Civil Rights of the poor and oppressed are everywhere backed. But never does a protest proceed from Rome to condemn the Communist atrocities against our brethren going on in Russia, Israel, South Africa, Nicaragua, Afghanistan, China or wherever. The civil rights of these people are not noticed by Rome. The mightiest scourge on human kind, Communism, is never condemned. The rights of the poor, the homosexuals, the Indians, and so forth are given importance, but not the rights of those Christians who suffer from the persecution of Communism. The “Vatican-Moscow Agreement” is still in full force. A. The St. Michael prayer was done away with in the Post Vatican II Church, because angels and devils were no longer certain doctrine there. To please the world and the non-Catholic religions it seemed necessary to deny or be silent about some Catholic dogmas. So these days Purgatory often has been denied, and above all hell. The good God could not punish one forever for a sin of a passionate moment. St. Michael doesn’t have to protect us from Satan because “there is neither Satan, nor hell.” So out goes the St. Michael prayer. The Mass begins with the sign of the Cross and it is part of the rubrics. All Masses but Requiems also end with the blessing in the form of a cross. I believe no sign of the cross is given in the rubrics at the end of prayers after Mass, because our prayers and the Holy Mass should not end there, but continue on till the end of the day. Father, without the a sign of the cross rises and goes to the sacristy leaving us the idea we should continue to pray. II Thess. 2:7 For the mystery of iniquity……..restrain it, does still restrain, until he is gotten out of the way. Footnotes suggest St. Michael the Archangel.. This entry was posted in Comments on SSPX, Current Events.